Timeless Memories for any occasion. Your true love, friends forever, new life. Capture all those memories – hold them forever inside a beautiful Aura Pendant. Choose birthstones and charms from the extensive Aura collection, then know you’ve created a perfect gift and a Timeless Memory. Aura Collection - Sterling Silver, May Birthstone, Aura Charm. Large 5mm charm, with Cut-Out Hearts and Swarovski Emerald Crystal, Gift Pouch. 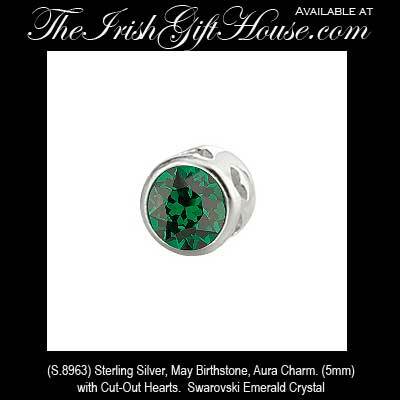 Solvar Irish Jewelry, Made in Dublin, Ireland. The unique locket style pendant allows you to customize your pendant for any occasion. Simply pop open the pendant and place the charms inside. The individual charms are manufactured to sit perfectly inside the pendant.